Stylish and nutritious. Classic and innovative. For families and for food lovers. Yes, you can have it all! Welcome to Daniella's kitchen. -Over 160 wholesome, family-friendly recipes that you'll make again and again -Turn fresh, healthy, and easy to find ingredients into spectacular dishes -Mouthwatering full-color photo accompanies every recipe -Each recipe includes cooking tips, techniques, and advice from best-selling cookbook author Norene Gilletz -Many recipes are naturally gluten-free or offer a gluten-free option -Nutritional information included for every recipe Daniella Silver, an exciting new personality in the world of Jewish cooking, combines an amazing sense of style and presentation with an understanding of what makes food wholesome and nutritious - and of what families want to eat. In The Silver Platter she brings us more than 160 recipes that allow us to explore new dishes, tastes, and presentations, all while keeping our families happy with great-tasting and wholesome food. Working closely with Norene Gilletz - the "matriarch" of kosher cuisine whose cookbooks appear regularly on bestseller lists - Daniella creates dishes that are a delight to prepare, to serve, and, of course, to eat. Daniella has an extraordinary sense of color and presentation, while Norene possesses a wealth of understanding and knowledge of kosher cooking techniques. Bring them together, and it's like having two gourmet chefs with you in your kitchen! Every recipe includes easily-accessible ingredients, clear instructions, a gorgeous photograph, "Norene's Notes" with tips and techniques, as well as full nutritional information for every dish listed in an appendix. More than 80 recipes are gluten-free, perfect for Passover and for those on gluten-free diets. 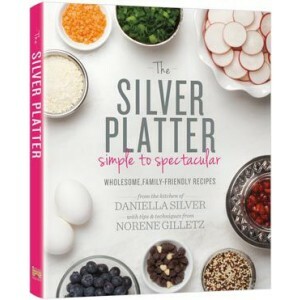 The Silver Platter features recipes for every occasion, from quick weeknight suppers to holiday celebrations. From the bold, unusual appetizers to the delectable desserts, and everything in-between, here are foods that are healthy to eat, spectacular to serve - and surprisingly easy to prepare. So... get cooking!